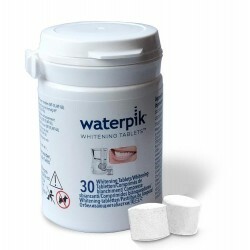 2 Orthodontic Tips for use with Waterpik® Whitening Water Flosser WF-05 or WF-06. The innovative tapered brush removes hard-to-reach plaque around orthodontic brackets and wires. It also helps flush out bacteria and food debris from around the teeth and under the gums. For use on orthodontic appliances and dental braces with Waterpik® Whitening Water Flosser WF-05 or WF-06. Clinically proven to remove up to 3x as much plaque as traditional string floss and significantly improve gum health for orthodontic patients. The innovative tapered brush removes hard-to-reach plaque around orthodontic brackets and wires. It also helps flush out bacteria and food debris from around the teeth and under the gums. For other accessories click here.